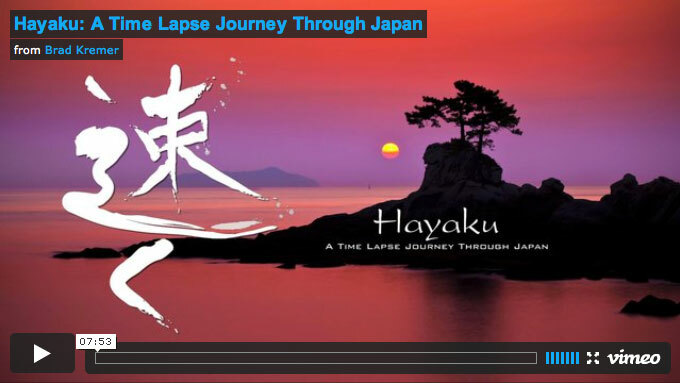 I'm so buried with work that I haven't even read email for a few days, but took a few minutes to check out Hayaku: A Time Lapse Journey Through Japan, a short but intensively beautiful video by Brad Kremer, and was so glad I did... it's a stunning video, even if you have no particular interest in Japan. As beautiful as it is at face value, it's 100× more so if you consider the effort and technical skill that went into it. I can imagine the long lonely hours of doing every aspect of it myself... except coming up with anywhere near the quality of final result. I'm left with an overwhelming sense of “I am not worthy”. Thanks to Stéphane Barbery for putting me onto it. Pretty incredible, both from an artistic and a technical standpoint. Just thinking about the amount of work that must have gone into that makes my eyes glaze over. I also appreciated how it captured the feeling of the place without resorting to either Japanophilia of Japanophobia. Wow! Impressive indeed! I suspect a lot of countries around the world would be honored if he would come and do the same thing in theirs. Maybe start his tour in America? Hint? Hint? Stunning imagery. This reminds me of the Time Lapse video that was unveiled prior to Vancouver’s 2010 Olympics. Thank you for the rich content! Watching that video makes you feel so insignificant but not in so much a bad way. It kind of reminds you how we tend to fixate on things that are so trivial. And that our lives are so fleeting. Those shots of Tokyo, the bridges and the intersections make New York City, look like a one-horse town. I love the street shot of that one really interesting intersection that curves around what looks like a traditional style Japanese house/building but everything that surrounds that dwelling is super modern. -> That was always the feeling I came away with from Japan: the most amazing and sublime mix of ultra-modern changes and timelessy ancient traditions. This is amazing, I am speechless. Thanks a lot for sharing. Made me have an inspiring start in the new week. Now I understand what makes us think some of this stuff happens in a miniature world — it’s the extremely selective DOF of these shots. Just last week I had seen shots of cars that seemed miniature but at the same time *so* real that they had to be real-world images. Now from this video I know that those were probably tilt-shift shots! Thanks! However, in this time-lapse I suppose at least some of the selective DOF has been done in post production. I especially love the unconventional DOF-change of the people having a picnic. First, everything at mid-distance is focused. Enters the ghost (at 1:48) and suddenly the front row and the long-distance are sharp, everything in between is blurred. That is freekin AWESOME! I’ve been up to my ears with work and haven’t posted on my own blog for a bit now, but I think I’ll make a short post with this video. Thank you very much for sharing.